Our house, a fond farewell? In recent news, Arnold and I have decided to put our house on the market and uproot ourselves once again looking for a house that better suits the way we are living these days. It will surely be an adventure, and hard for me, who doesn’t do well with big uncertainties, to say the least. I wish we had the money in hand to just buy whatever new place we fall in love with and sell ours later, in a leisurely fashion, but we don’t. And friends here who tried that gambit ended up not able to sell their original house and now have it rented out. They are enjoying being landlords and having the extra income but we – alas – will need every penny we can wring out from the sale of our present casa to propel us into the next one. As our real estate market here is so tied to whatever is going on in the States, the market for sales is awful, and as you’d expect, the market for buyers is full of relative bargains. There are loads of absolutely beautiful places up for sale here so finding something that we will both love will be the least of our worries, I think, once we know how much we can get for this house and have an offer on it that looks reasonable so we can forge ahead. The good news about living in Mexico is that with few exceptions there are no mortgages. Every sale is “all cash” which frees you from the stress of worrying about those horrid payments every month. Being free of debt in a house I never could have afforded back in the States was one of the things that I found attractive about the idea of retiring in Mexico. But propelling yourself out of one house and into another is in a way more crazy-making, because no matter what price you negotiate on both the sell side and the buy side, you still have to arrive at the notario’s office on the day of your closing with the requisite fistfuls of cash for the entire purchase wired to your seller’s account. So you dare not fall too much in love with any house that is more than what you can scrounge up in real money – but on the other hand if you don’t go out and look you have no idea what is really, truly, out there for sale in your price range, so it is a little bit crazy-making, but this is where we are right now. First step, get ours on the market and see what happens over the next few months. Our real estate agent is telling us – and we know she’s right – that right now, when all the snowbirds are in town till April – is a good time to be putting it up for sale. In spite of all the bad publicity about Mexico, there are at least a few buyers out there, apparently. It will tear me up to leave this place when the final days here come, especially the garden, which I carved out of what was basically a cobblestone parking lot. 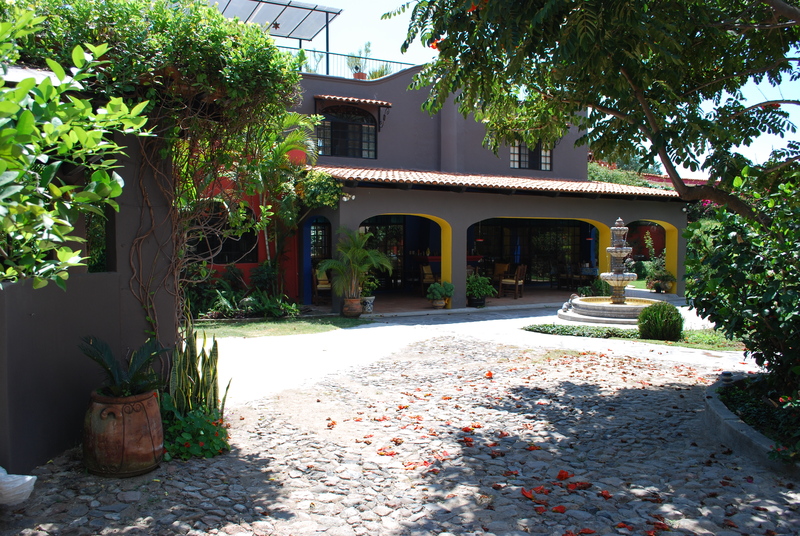 It has become really beautiful, a sanctuary for birds and butterflies, with two fountains and dozens of flowers everywhere, plus we are growing all kinds of fun things – bananas, mangoes, papayas, limones, avocados, and all sorts of herbs and spices – all the bounty that a Mexican garden provides year-round as a matter of course. I am hoping that someone else will in turn fall in love with it on the spot and want to live here. But there is no doubt in my mind – nor Arnold’s, I suspect – that in many ways we have outgrown the house itself and need something with a different configuration. Short of remodeling this place, which doesn’t make economic sense as we have way more into it now than we’ll ever get out, given how the market has declined – to get the space and quiet we are looking for these days, we will have to move. So this week the preparations have begun. I called our trusty construction guy, Ricardo, last week, who has sent over three or four workers who are now crawling around painting, plastering, repairing, redoing the floors – the cosmetic stuff you know you should do when you are simply living in a house (but never get around to). Of course these repairs become imperative once you decide to put it on the market, and it has to be if not impeccable, then more presentable than what you just ignore most of the time before you make the decision to sell. It’s weird; we have even rearranged some furniture and reorganized things “for showings” and realized that we should have made x change years ago because it looks so much better now. Why didn’t we do it before, why didn’t we see it before? It is interesting how a stay in the hospital for surgery, heart procedure, whatever, can change your perspective on your life. In my case, my ailments were painful and inconvenient but not life-threatening; but Arnold’s heart adventures – plus the fact that he’s ten years older than I am to start with – have made him more aware of the passage of time in recent months. It seems like getting into, or approaching, your seventies can put your own mortality into sharper relief. Especially dealing, as we do every day, with the agonizingly slow departure of my mother, who will turn ninety in a few days, but has spent much of the last third of her life in an inexorable physical decline (much of which she could have fought against but didn’t) that has left her completely bedridden and unable even to talk these days. Thus we are both in a “if we are going to do things, we need to do them NOW” kind of place, and dealing with the house, the inevitable addition of some of my parents ’ treasured Mexican furniture, and the changes in the way we are living these days, is inevitably pointing to moving rather than trying to patch something more accommodating together here. Everyone is asking us – since our present house is two stories – and actually three, if you count the rooftop mirador where I take my morning coffee for a view of the mountains and the lake – if we’re downsizing and looking for something on one level. Typical of us, al contrario, the one house we both managed to fall in love with is three levels as well, with breathtaking views of the lake from high up on the mountainside. If we get serious about it we will have an elevator guy come from Guadalajara to look at it and tell us whether and how they could eventually put an elevator, or one of those chairs that move up and down stairs, into it. But we don’t want or need to anticipate being incapacitated just yet. Neither of us needs it now and we seem to be doing fine with the stairs in the house we have , so we can know it’s possible and leave it at that until or unless we need it down the line. Since my surgery, I have not been allowed to do the kind of exercise I was doing before, so the stairs actually are about my only exercise right now, for the next few weeks, at least. Arnold refuses to do the “look at a one story place” routine; we’ve always lived in two-story houses and I think for him it’s a kind of surrender. Anyway, pun intended, many steps before we get to the rearrangement of x new house wherever it may be and whatever tweaking it might need. Show us photos of your garden, please! Will try to post some! Thanks! Gardens where we are just grow like mad and now that it’s the rainy season here everything is in bloom and thriving. I’ll try to post some garden shots soon….